The Moth consists of an eclectic mix of established and new writing. It includes short stories and poetry from up-and-coming poets and short story writers alongside intricate artwork and interviews with established names – in this issue Emily Berry. 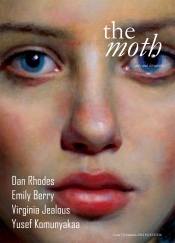 Reading The Moth takes the mind on a journey, leading the intellect through brutal realism, floating surrealism, and intriguing passages with the intensity of compulsive pressure of speech. The magazine opens on a high with the impulsive outpourings of Dustin Junkert. His energy and self-referential style really fired up this reader, ready for a series of varied creative experiences. Junkert’s direct reference to writing in the final two lines of his poem: “’Are you as good as James Patterson?’ I said, ‘I’m no James Patterson’”, immediately gets us thinking critically about the literature that waits on the other side of turning the page. This energy then continues with the first short story of the magazine- Emily by Mandy Beaumont, my favourite piece in the entire issue. It uses similar run-on lines and long sentences to the opening poem. Emily is a story of wishing and dreams – of all that might have happened “if only…”. Yet it is also a vital story of young sexual arousal and considering the possibility of love. This sense of eroticism, combined with intellectual technique and ultimate beauty is spread throughout the rest of the magazine. Most notable of the art that accompanies the writing are the paintings of Wen Wu. Wu uses a combination of classical painting and modern fashion culture to create surreal paintings. His style is similar to the work of the Pre-Raphaelites, yet always with a 21st century twist. The atmosphere of Wu’s paintings is emulated in the writing that surrounds them, in particular the poem A Bee Flat Sonnet by Sarah Jefferies. Jefferies has a real sense for the ethereal, yet also connects her poetry back to the real world using very specific details. In this way her poem has some of the same qualities as Wu’s artwork, showing how the arrangement of artwork alongside poems creates new dimensions to both. It is something The Moth is very good at. I also very much enjoyed the final short story of the magazine: Upcycle: An Account of Some Strange Disturbances in Botanic Road, by June Caldwell. The strange title is the first sign of a bizarre, almost schizophrenic thought pattern, which the voice of the poem continues to use to communicate throughout. The story is speckled with Homeric-style epithets, utilised to describe idiosyncratic characters and the kooky world surrounding them. The first and last stories actually have a lot in common. They are both examples of an intense and impulsive style of writing. They are also both highly odd, in their own way. This is something a lot of The Moth contributors have a talent for. It is impressive that one magazine can take on all of these unusual views of the world, and still maintain a cohesive structure. Yet The Moth achieves this in a seamless manner that allows the reader to flit between story and poem, always reassured that the voice about to be revealed to them will be interesting and entertaining. Read more about The Moth Issue 18 here.